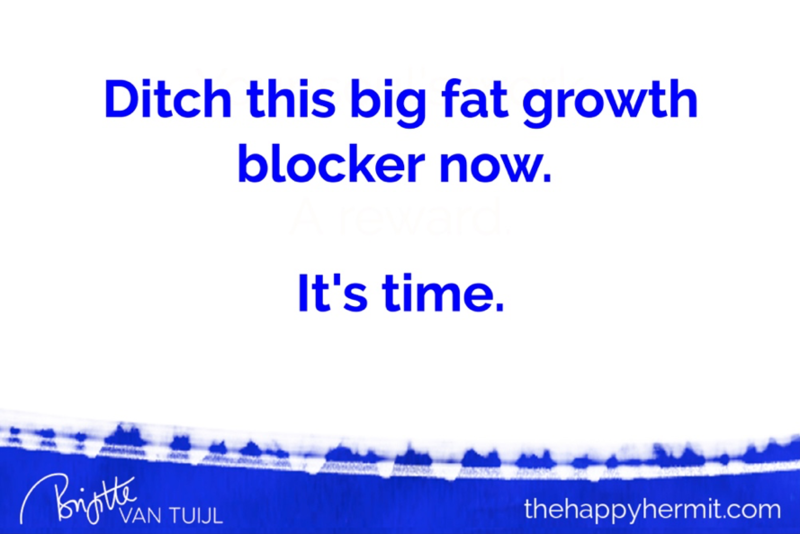 Ditch this big fat growth blocker now. It’s time. For years, I sent weekly emails to the people on my list every Wednesday. But recently, I stopped doing that. I’m sharing my process with you below because it might be time for YOU to check your (business) routines as well. Holding on to ANYTHING that no longer serves you is a big fat growth-obstacle. And if you want to take your business (and yourself) further than it is today? You’ve got to let go of everything that’s stifling your growth. EVEN if that means letting go of something that’s actually HELPED you grow before. I created the structure of sending out ezines to people on my list in 2005. At the time, I was MASSIVELY afraid to make myself and my business visible. I wanted to write, but was scared of it, too. And I knew I needed to market my business, or else I’d have to go back to a j.o.b. When I learned that writing could actually be a way to market your business, I decided that that was my way to go. But almost everything about it scared me. Being seen scared me. I was afraid to run out of topics to write about. I was afraid I would fail. And I was also afraid I would succeed. To send one article per month no. matter. what. After a while, I decided to stretch myself more to practice my writing, and to overcome my fear of sharing what I wrote with others. So I added a weekly mail in addition to the monthly articles. That made 5 articles I ‘had’ to write each month. I overcame my fears enough to be able to publish my first book in 2008. After that, sending out 5 emails to 2 different lists felt restrictive, so I cut it down to one article per week, sent out on Wednesday. And I stuck to that structure for YEARS. It helped me to continue to write, make myself visible, and market my business. For a long time, I NEEDED that structure to keep myself moving forward and stop myself from hiding from the world. I liked sending out an article once a week. I played with the format; with several kinds of weekly segments; I stretched myself in unleashing myself more, and no longer censoring myself on any level. Until this structure stopped feeling good, and it started to feel like a chore. That’s when I decided to release myself from this structure. It has served its purpose beautifully. Now, I write when inspired. It could be on Wednesday, it could be on Sunday, it could be 5 times a week or hardly ever for a while. I just go with my flow. That always works best. Are you still holding on to structures, rules, habits or routines that no longer serve you? Change your routine or schedule, or ditch it all together. Anything that doesn’t serve you is actually holding you back!!! Are you reluctant to change it – even though it no longer works for you? Is it because you don’t trust yourself to keep moving forward without this routine? Because you fear your new routine might work better and actually bring you what you want? Because you think you must stick to it because others do it, too? And the ‘gurus’ tell you that you should really do this or do it that way? Or is it because you think your (potential) clients won’t like or accept it? Let go of all of these stories. Your structures, habits, routines, schedule & rules should SERVE YOU – you don’t exist to serve THEM. Give yourself WHATEVER you need to flourish & thrive now. If that means creating new rules & routines or sticking to the ones you already have? If that means throwing out habits or schedules that worked for you before? Your habits and routines should SERVE you AND your business. They should liberate and motivate you. And they should help you move forward in the direction of your dream(s) – not take you further away from it. I’ll say it one last time: anything that doesn’t serve you anymore is actively holding you back, right now. Take a look at what still serves you – and what no longer does. Don’t worry about what others may or may not think about it. This is about YOU and YOUR dreams and YOUR freedom and what makes YOU feel happy, inspired and alive.